Synonymous with school dinner halls and work cafeterias of yesteryear, the iconic Duralex glass is making a comeback. Made in France, the fluted-edge Picardie and straighter-sided Gigogne tumblers (pronounced je-go-ne) date from the late 1920s. I love their stylish, yet functional hard-wearing style. The original publicity for the glasses claimed that they could be “used as hammers”. Though I haven’t yet tried to knock in a nail with my set, they are indeed practical for many other uses. The 9cl Picardie glass measures out the perfect shot of espresso for my Sunday morning latte, and the 22cl Gigogne glass is great for serving wine when eating al-fresco with the piece-of-mind that they are shatter-proof. They are sure to bring a little bit of vintage charm to any table. My friend is redecorating her bijou bathroom and would like to introduce the colour gold into the scheme. I suggested she think about painting the ceiling in a metallic gold finish. This will not only help to create the cosy, pampering haven she wants, but also bounce light around the windowless space. I’ve done something similar in my own bathroom, which also has diminutive floor space but an unusually high ceiling. By painting the ceiling dark grey, I’ve visually lowered it and so re-proportioned the room. The grey also provides a striking contrast against the white tiles which now sing out and make the room look brighter and bigger. So often, we overlook the ceiling when planning the décor of our rooms, even though it’s one of the largest surface areas. A dose of colour can not only alter the geometry of a space, but create a sophisticated and polished look by pulling your whole scheme together. So next time you’re planning a revamp for a room, don’t forget to look up and think of the ceiling as the 5th wall. Here’s a few ideas for inspiration and you can find more on my Pinterest board. Follow Samantha’s board Painted Ceilings on Pinterest. 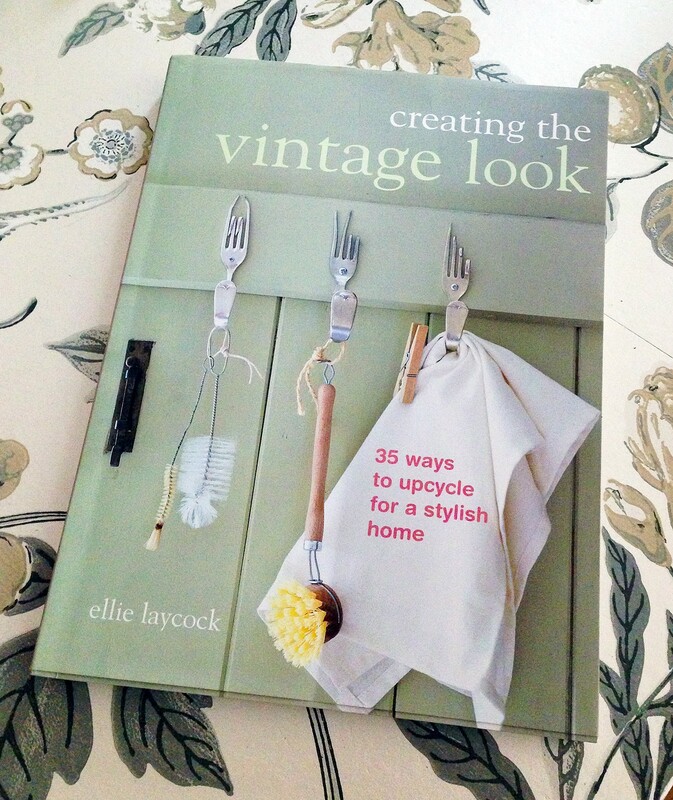 On the lookout for inspiration for my next home crafting venture, I came across this book by Ellie Laycock, founder of homewares company Hunted and Stuffed. With clear instructions and gorgeous photos it features 35 clever projects to re-purpose items you may find at jumble sales, markets or second-hand shops into personal treasures for your own home. The Ladder Back Chair Towel Rail, Soap Dispenser Jars and Russian Doll Light Pull are particularly ingenious. So, I think I’m pretty much set for the next 35 weekends. I mentioned in an earlier post that I bought some ceramic alphabet hooks from Oliver Bonas. I used these to make a vintage style coat hook rail for the hall. I had an offcut of wood left over from a previous DIY project which I stained using 3 coats of Colron Jacobean Oak Wood Dye. It’s very easy to apply using a sponge and dries in no time. Once that was done, I measured out an even spacing for my four hooks and then screwed them into the wood using the fittings provided. As the screws were longer than the thickness of the wood, I used washers – a top tip I discovered courtesy of Saw Dust Girl. This saved me having to saw off the ends of the screws or search my local DIY stores for shorter fittings, and added another individual look to my rail. I then drilled two pilot holes at each end of the wood with a countersink, ready to then mount the rail onto the wall using a spirit level, hammer drill, appropriate rawlplugs and screws. Much easier to drill four holes into the wall, than individually drilling the hooks into place. Every time I pass one of Oliver Bonas’ boutique shops, I just have to pop in. Enticed by the array of bright and quirky homewares and fashion at affordable prices. Founded 21 years ago, the stores still adhere to founder Olly Tress’ vision and passion for seeking out the unusual and his love of good, individual design. I don’t leave without picking up one of their gorgeous smelling scented candles or a couple of their fun greetings cards. Their bestsellers are the Malibu drinks trolley and tub chairs designed exclusively in-house and in the UK, and available in an assortment of vibrant colours in Designers Guild cotton. Most recently, I purchased a few of their ceramic alphabet hooks which I’d been coveting for a while. They remind me of the keys on an old typewriter my parents used to have and I had an idea for using them for a home crafting project (more on that to follow). Last Friday I helped out as a volunteer for Living Etc magazine’s House Tours. If you’ve ever wondered what some of London’s grandest houses might look like behind their elegant façades, then this annual event offers you exclusive access to step inside and have a peek. In the morning I helped look after a five bedroom family home in Bayswater. Five floors of light filled, pared back, clean lines designed by architect Michela Bertolini. I did my best to answer some of the questions from visitors. I had learned that the flooring was Dinesen oak with a lime wash and most of the large format photography in the house was by French artist Noemie Goudal. In the afternoon I went off to see the rest of the curated tour of beautifully decorated and renovated homes. From a house filled with a riot of colour and pattern, to another with a calm country cottage feel. All tastes catered for and a great opportunity to find ideas for styling your own home, and indeed, feeling inspired I went straight home and rearranged the ornaments and furniture in my lounge.